Great to work with and friendly. Great house. We need to stay during warmer weather instead of winter time. Elaine was excellent. She responded immediately and followed through perfectly. This is a nice property directly on the bay with fantastic sunset view. Very relaxing. Lance and Elaine were helpful and Elaine answered texts quickly. Loved the location on the bay. Wish the weather was better but we were competing with Hurricane Jose. Check in and check out were very easy with the lockbox. Upstairs bedroom with deck was very spacious and had a great view. The regular communications from you and details on check in/out were very helpful. Whole reservation process was very easy. Only challenge was interacting with CSA over travel insurance. We received multiple policies and cancellations from them that took several calls to clear up. Service and explanations for missteps were never satisfactory and staff never helpful. Never sure if we had coverage or not. I would hate to have to deal with them on a claim!! Stay was fantastic. Look forward to returning. 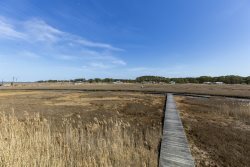 I loved the property, especially its quiet location on East Side Road and the screened porch from which I could see Assateague Lighthouse across the salt marsh. After dark, the beam from the lighthouse illuminated the kitchen wall -- I thought this was really neat. I appreciated all the supplies provided (I have stayed in vacation rentals in Fla. and the Outer Banks, where there is not even a roll of toilet paper, no salt and pepper!). There is a big tortoise who lives by the driveway and I saw him walking up the drive one morning, so people should be careful when they drive up to the house. I'll be back! The team members were very responsive and courteous during the check in and check out process. There was no need to contact them for maintenance issues because there was none. The property was top notch! The property was just what we were looking for! We were visiting Ocean City for our son's wedding and for an extended vacation. We had the grandparents with us so the one-floor layout was ideal, as was the elevator. The condo is actually more spacious than what it looks like in the pictures. We also had the ushers staying with us for the weekend and everyone was very comfortable. The property is very well appointed, well maintained and very quiet! I highly recommend this condo for a large family or two families staying together - 2 master bedrooms with their own bath! Loved it! And if you love the beach, this is the place for you! We usually stay on the ocean side but wanted to try the bayside. Couldn't have gotten a closer or better spot right on the bay. You could watch the beautiful sunsets right from your balcony. The community was clean, well maintained and the people who live there were nice and friendly. The pool is right on the bay so it was nice to be able to sit by the pool and watch the boats. The unit is clean and well equipped. We liked the dcor and liked that it wasn't cluttered with too much stuff like some other places we have stayed. Thank you for a terrific experience. Both Lance and Elaine were very prompt with communications and volunteered assistance and phone numbers if we had any issues or questions. Amazing boardwalk location for a beautiful condo. Dining room and living room are very tastefully decorated. Beds were very comfortable. An overall enjoyable stay.